This topic contains 15 replies, has 6 voices, and was last updated by Keric 2 years, 7 months ago. I haven’t held a contest before but an idea came across my mind that I thought could be fun. For this challenge, your job is to create a team-up image of a character(or characters) of yours and a character of mine I will be posting. The image could be a fight between the characters or a team-up of the characters against someone else or just the characters hanging out. Or whatever else you can think of the charaters doing together, as long as the image features my character and a character(s) of your own. Your character can be a previously made character of yours or one made special for this contest. 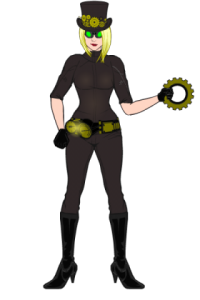 For my character in the image fell free to use my design or your own interpretation of my character. I hope to get some good participation for this, and if I do I will keep the contest going with more and more of my characters. I know multi-character images can be time consuming so each contest will last two weeks. At the end of each contest I will pick a winner. 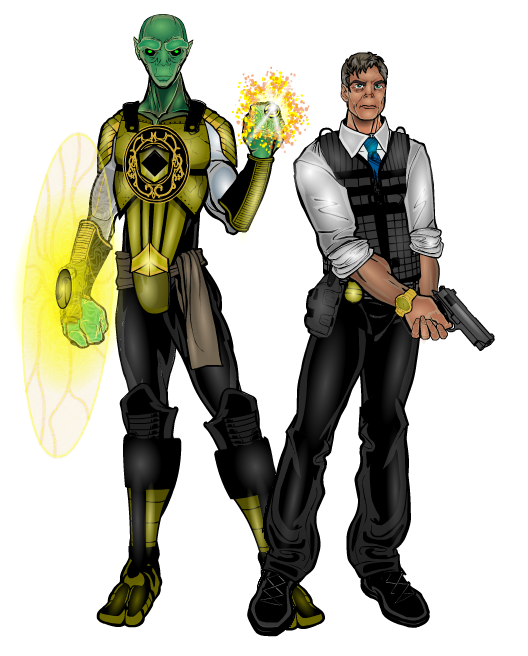 As a prize I will create a team-up image of of one of the winners characters and a character of mine of the winner’s choosing. I think first I’ll go with Flash. Flash is your average street level hero. 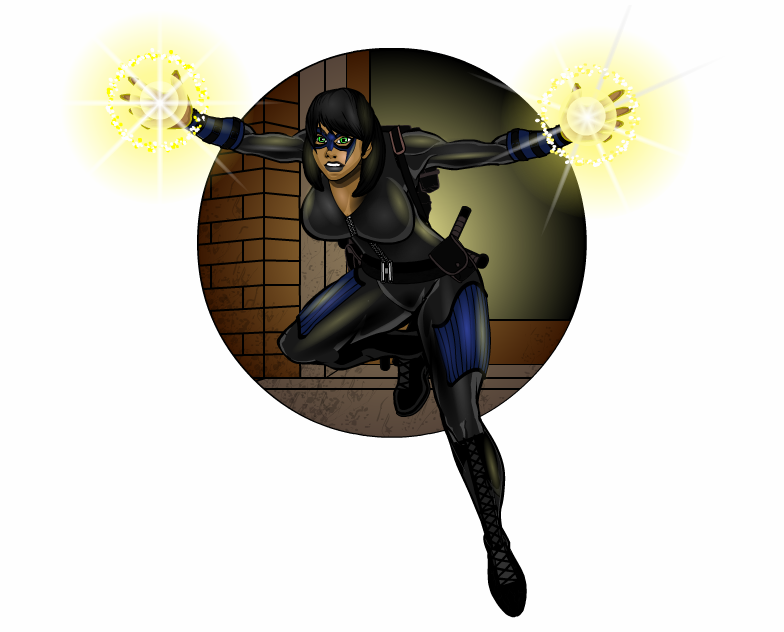 Martial arts expert, uses gadgets, smart and resourceful, with one minor power, she is able to emit light from any part of skin. The light can be anything from a low glow to see in the night to a bright blinding light. If you choose to do your own interpretation of her I only ask that she remain African-American and her colors be predominantly black and blue. Here’s my entry. I teamed FLASH with her new partner, MOB! Mob can control his shadows and become a one man “mob”. 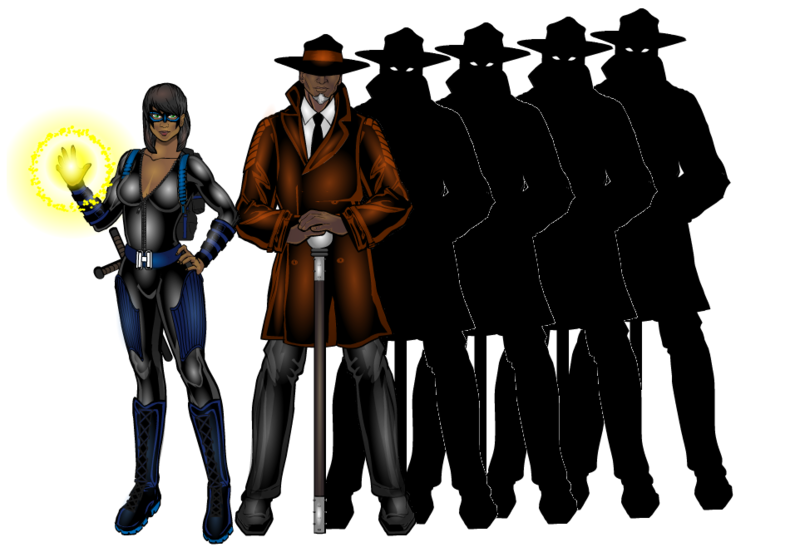 He relies on Flash to help him create his shadow mob with her light emitting powers. Together they are a formidable team. This reply was modified 2 years, 7 months ago by ams. Yeah! I was starting to wonder if anyone would enter. Now let’s see some more! An Idea can be slapped together and end up a flop, Some Ideas need time to marinate! Man, I even forgot about this. Guess I should judge since it’s been more than three weeks. I only got three entries but they were three good ones. Vectorman‘s entry was fun and I love his Overkill character. And I love the colors. So vibrant. I like Keric‘s more armored take on Flash and the contrast between her and the more “savage” Tarzan-san. I would’t want to be whoever they have trapped in that alley. But, I’m going to have to give the win to ams. I absolutely LOVE the concept of Mob and how he works with Flash. So, ams, let me know which of your characters you would like to see me team up with which of my characters and I will get to working on that. Although I only got three entries I am going to run this contest again. 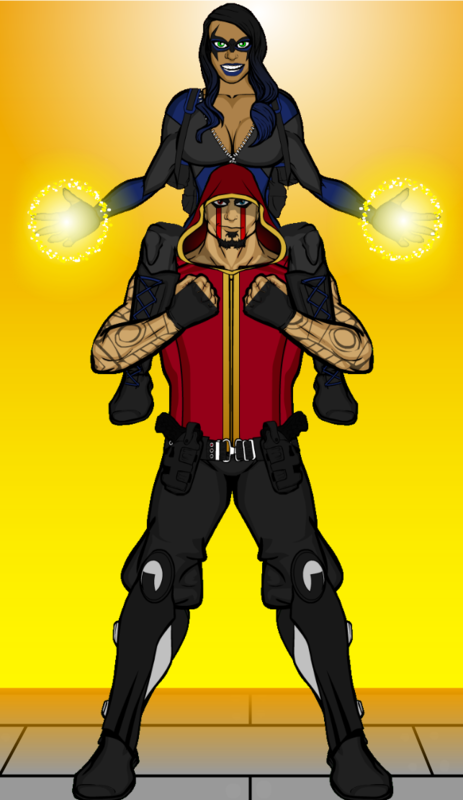 New character of mine to team-up to come later today. The Last Guardian is the last surviving member of an intergalactic police force who fled to our galaxy when his was destroyed. 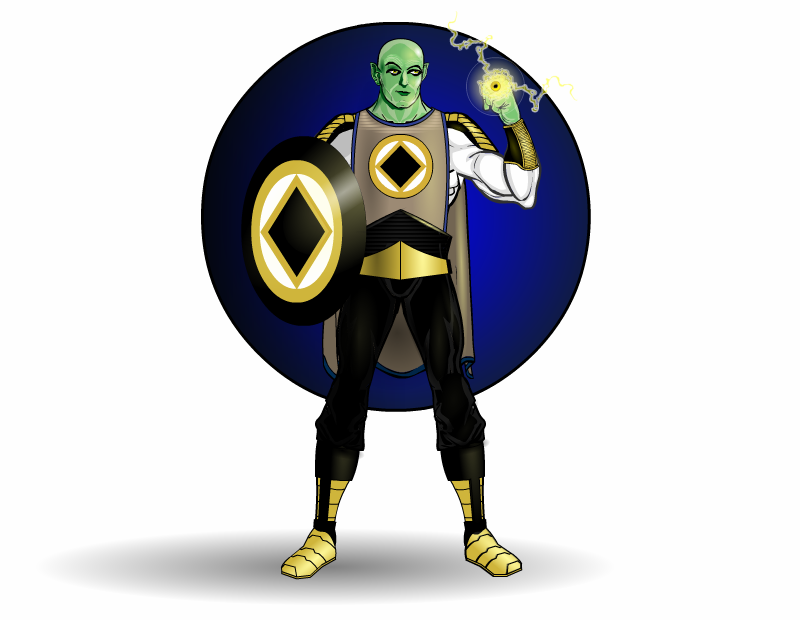 Like all Guardians he carries a invincible shield and has a ring that can manipulate energy and acts as a type of personal mini computer that can be used to analyse/navigate/communicate/translate and more. One thing his ring CAN’T do is create energy constructs, it is NOT a Green Lantern ring. I want these contest to start/end on Sundays so I am going to let this on run until Feb 9th. That’s a over two weeks so let’s see some entries. And have fun! Have to see if I have any time for the last guardian. I do have some ideas…. Are they on a date? On a prostitution sting? Dancing with the meta stars? I leave the backstory to you, All I know is Redhood and The Last Guardian have teamed up to dance! Quirky story, but I see this as a “buddy cop” movie story line with the down to earth cop and the outer worldly protector. Cheers!